A security guard and his gang members have been arrested after they brutally murdered a Lagos businessman. Security operatives have arrested a security guard and 3 others for murder in Osun State. It was gathered that Rasheed Waheed 35, Ahmed Rafiu 33, Owolabi Bashiru 51 and Kayode 27, killed Lagos businessman, Victor Akinbile, 48, by setting him ablaze while locked in his car. 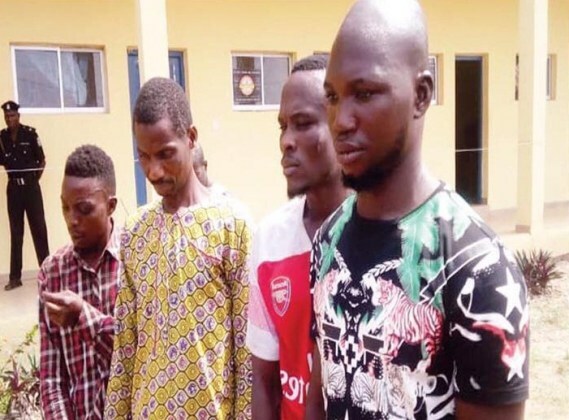 "The gang came to the victim’s abode, broke into the house and took the N25,000 he was having on him and equally forced him to transfer N3 million to the account of one of them. "They then put him in his car and drove him to a secluded place where they set the car alight, while he was locked in the booth .